It may be over 40 years since Tony and Maureen Wheeler wrote their first Lonely Planet Guide , but the brand shows little sign of relinquishing its top spot as the Number One Travel Guides. However recent changes at the company have suggested a move away from a traditional book publisher to a multi-platform brand. What ever the future is for Lonely Planet, one of their recent publications, Discover London perhaps shows signs of a snappier style with more photographs and more colourful format. The first part of the guide is a quick introduction followed by London Highlights section which include all the usual attractions but also some less well known like the Royal Court Theatre or the 606 club. Once the highlights are completed , there comes advice on what is the best ways to see them with a series of itinerary suggestions called Top days in London. A month by month guide to London main events is followed by What’s New , Get Inspired and Need to Know. The next section divides London into areas and offer a comprehensive account of each area related to its particular character, places to visit and decent eating and drinking places. One of the best features of Lonely Planet guides is that they generally provide the information that most people are looking for and don’t get bogged down in information which might be interesting but is unnecessary for the traveller on a limited stay. The areas are interesting because I suspect if we were looking at a guide even ten years ago it would have included the West End ,the City, the South Bank, Kensington, Hyde Park, Hampstead, North London and Greenwich , but Clerkenwell, Hoxton, Spitalfields, the East End and Docklands sections would have been very short or non existent., The rise of East London especially based around the 2012 Olympics is one of the major stories of London’s recent past. It is some of these recent developments in London that get discussed generally within the In Focus section with regards to Architecture, Literature, The Arts, Shopping, Food and Drink amongst others. This section is important to consider the trends and fashions of a fast moving London but which are usually paying homage to London’s past. Finally we have the famous Survival Guides section which gives you all that local information you need to make your stay as hassle free as possible. In a fast moving city it is increasingly difficult for guide books to be up to date on certain aspects , therefore listings of Hotels, restaurants and clubs are far shorter than perhaps they once would have been, but this is probably one area that online information will win out over guide books. Tony Wheeler when he was co creating Lonely Planet believed a great guidebook should do three things: inform, educate and amuse. 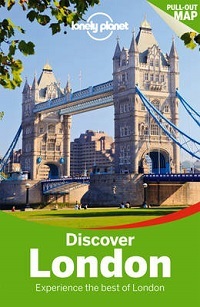 Discover London follows that noble Lonely Planet tradition with a great selection of maps ,photos and nuggets of information. It is a well written , knowledgeable and informative guide book that follows a long tradition of Lonely Planet guidebooks being written by local writers who want to share their love for their city but have the honesty to mention some of the negative sides of London life. London Visitors is the official blog for the Visiting London Guide .com website. The website was developed to bring practical advice and latest up to date news and reviews of events in London. Since our launch in January, we attract thousands of readers each month, the site is constantly updated. We have sections on Museums and Art Galleries, Transport, Food and Drink, Places to Stay, Security, Music, Sport, Books and many more. There are also hundreds of links to interesting articles on our blog. By londonvisitors2014 in London Book Review - Non Fiction on June 4, 2014 .